The EISCAT facilities near Tromsø (Norway) include a radar there which operates at 931 MHz. This is what the team will be using for their observations of 2012 DA14. 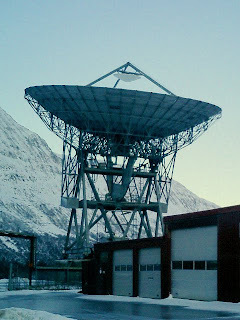 The dish is 32m in diameter and is fully steerable. The radar power is provided by klystron technology and coded radar pulses are transmitted towards the asteroid 2012 DA14. Using timing, pulse-decoding and all the other required calibration techniques, the faint echoes that are received from the asteroid can be interpreted to discern critical parameters about the fly-by. Events of this kind are not common and there is a lot of work to be done to prepare the system for the observations. The team is working flat-out to ensure that everything is in order, calibrated, tested and ready for the pass.